I am still under the weather - instead of getting better I am worse today, sneezing and coughing. I did manage to go downstairs for a while so I could "play" with some paper and I made a few cards. These are for Thanksgiving (very early for me!). I have always loved Debbie Mumm fabrics - I have lots of them waiting to be turned into quilts. I was very excited when she started doing paper as well. 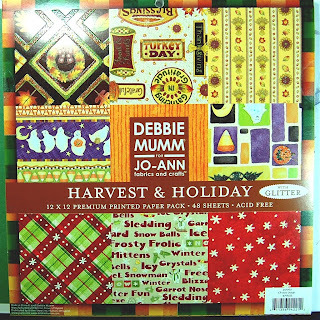 I bought this stack last year at Jo-Ann's - there is a new set of Harvest and Holiday paper and cardstock available this year. If you are like me and still have last year's in your stash, it is time to start using it up! I took this piece of 12 x 12 and cut it up into individual motifs, leaving a border where I could. The images are glittered and very shiny. For the first card, I started with an A2 base (5.5 x 8.5 inches folded in half). I was putting things away and came across some double sided bead or glitter tape that I bought on sale and hadn't tried yet, so I made a 1/4 inch green glitter strip along the bottom of the card. The tape did a good job but glitter sure is messy to work with. I am a bit sparkly and so is my floor! 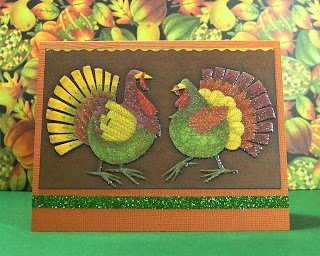 I trimmed the section with the turkeys and left the bit of gold border at the top. 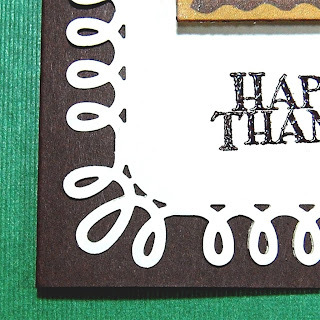 I used some brown ink on the edges to be sure the white side of the cut would not distract from the finished card. 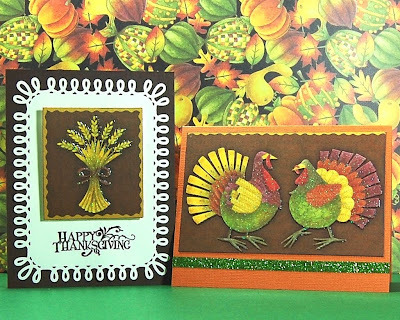 For the second card, I used the Martha Stewart loop Punch Around the Page set. These punches work with very specific measurements to make a perfect edge. 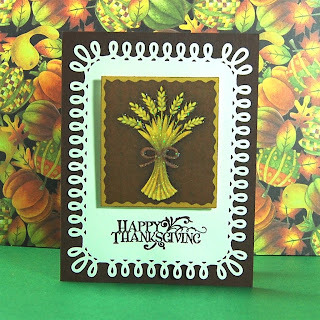 If you click this LINK you will see another card I made using this punch and you can also see the instructions for making the borders. The sizing does not fit the topper for an A2 card perfectly, so I adapted the pattern by punching the corners and then centering the border punch on each edge, leaving a small gap that I trimmed with sharp scissors to even out the design. 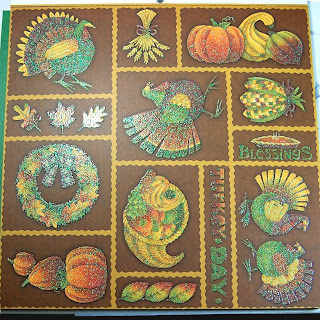 The sentiment is stamped and embossed with brown "Zing" embossing powder. I hope you are having a nice weekend - we have terrible weather predicted for tomorrow which is a shame since it is the Head of the Charles Regatta in Cambridge/Boston this weekend. I will be staying in again, drinking lots of tea and trying to get well! I sure hope you feel better really soon! I'm in the same position as you, not feeling as well as I should with hot/cold and sneezing. I need to make my Halloween cards still. 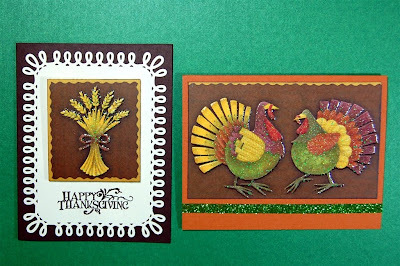 I love your Thanksgiving cards, very pretty and so fall colors. Take care.